Once again it is time for the Rudolph Days Challenge. Our designers have been busy making some wonderful inspiration for you all. I love the sweet image Linda used here! This Santa Hedgie has almost delivered the last of his presents. 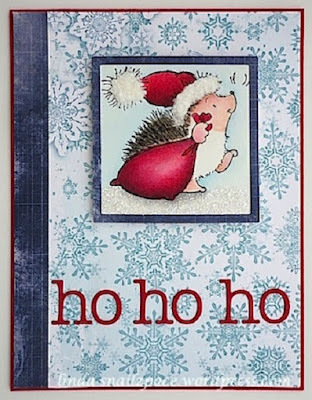 This wee Hedgie is perfect with this Ho Ho Ho sentiment. I think Linda created this snowflake background. 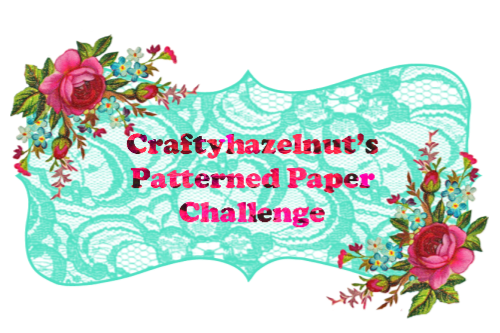 I am going to pop over to her blog and read her post to see how she made it! I hope you will pop by her blog too and leave her some compliments! Sonia has made this delightful accordian card. 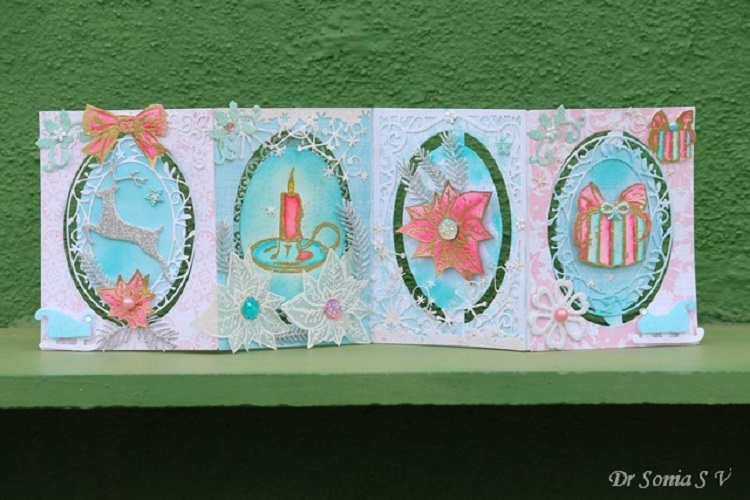 I am loving the soft, non-traditional colours and the pretty die cuts used here. Methinks I now want to make an accordian card too! I am looking forward to reading Sonia's post as she always gives such clear and easy to follow directions. 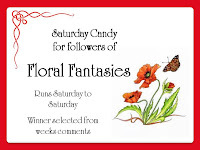 Pop on over to her blog and read along. I am sure she loves comments too! My card was made at the recent Langley Stampers Card Box outing. Per usual, I forgot to write down the names of the reindeer and wreath die cuts and the embossing folder, but I do believe the red birds are Impression Obsession. The hills are perhaps Lawn Fawn or Stampin Up...? We cut the background hill from white glitter card and then embossed another piece of it with the birch tree folder. The reindeer is cut from a silver pearlescent card. The birds, wreath and bow were cut from snippets of green and red card. We painted over them all with Wink Of Stella. I made a boo boo on the inside of my card. I did not press evenly with the sentiment stamp and have some lighter patches. I can not try to correct it at the moment as I am not at home. I usually take an ultrafine black copic pen and sort of place wee dots of ink along where the missing bits of lightish ink are. It seems to blend in better that way as when I just try to draw in the missing light ink, it seems to stand out too much. I'm first! Lovely cards as always. Happy Rudolph day. sorry I pressed enter before I put my proper link on the Link up. Can you delete my first entry please. Sorry to cause you so much trouble it's the old brain gets fumbled at times. Beautiful DT creations from Linda, and Dr Sonia. Will be visiting them shortly. Your card sounds wonderful can't wait to see it. It can't possibly already be the 25th of the month! At least it is a long month. The cards are beautiful! Thanks for the inspiration! Oh wow--you guys really hit it out of the park this month! Love every one of these beautifully creative cards! Great selection of cards - the months seem to get shorter every time can't believe it is Rudolph time again already. happy Rudolph day! I wish I could take credit for the snowflake paper, maureen, but it's from a 6 x 6 pad. beautiful cards! I think I'll try an accordion card too, I love the pretty colours dr. Sonia used and I love the pop of red cardinals on the birch trees of the wintery scene! Thanks for the great Christmas cards the DT shared, as well as yours Mo! Love that reindeer with the wreath around it's neck and all those tiny red birds on the trees! Good job everyone! Great shares from the Rudolph girls. Managed to make it in time this month, sorry for the no show of late. Lovely creations from the DT, thank you for the inspiration. Such sweet projects this month. I'll be linking up my card shortly. 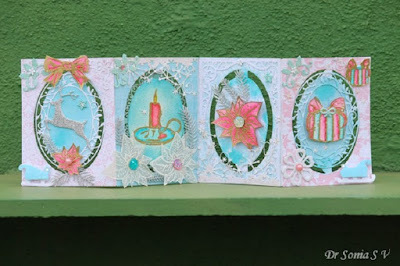 Loving your card with all those fabby die cuts .. .. and the inspiration from the DT too. Just right for getting us all geared up for all those Christmas makes we need to do. This is my first time entering so I hope I did it okay. I am really getting into the Christmas card mode now. Thanks for sharing so much inspiration too! Lovely DT cards, each uniquely different and inspiring. All of these cards are just beautiful and I love your die cut deer. Thanks for the tip about filling in a stamped sentiment because I have that problem all the time. what a wonderful card and the super sheen is gorgeous. Love the wonderful scene you have created. Those embossed trees are wonderful, and what splendid idea the wreath around the reindeer or stags neck. This is such a majestic deer, Mo! I love the forest scene and I'll bet it really sparkles a lot IRL! Thanks for hosting this fun challenge. Your card is beautiful, Mo. I love the pretty deer with the wreath and the small red birds! Have a great week! Great inspiration! That crazy holiday will be upon us before we know it. Oh goodness! I uploaded my card but somehow the link url shows up instead of my name. Then it appears again, with my name this time. As they are duplicates of the same card, please disregard one of them. Sorry to have messed up but I guess my head is a bit muddled tonight! Thanks for sharing all of these beautiful Christmas cards in the challenge. I could do with some winter cold right about now, as it's hot and uncomfortable where I am! Super cute cards by the DT, lots of cute inspiration! Wow what a great variety of fab inspiration cards here. I'd be hard-pressed to pick a favorite because they all feature different looks and techniques. Great job ladies. Love the embossed background on your card Maureen and once again allow me to tell you how much being your DT means! Making Christmas projects has always cheered me up and I find that I am inevitably cheered up whenever I have to share a DT project for you here at the Rudolph Challenge !! Just heard about your challenge - joining in for the first time! Three lovely creations from the team, super images and designs. Absolutely gorgeous Christmas cards Mo! I've already commented on Sonia's amazing card as she linked into the Playground. Will now hop over to Linda's to leave some love. And last but not least I adore your card - total elegance! Me again! Just spotted your comment which did indeed pre-empt me linking into RD this month! So busy doing other things I forgot my post has gone live today! Thanks for keeping a close eye on things! Fabulous DT inspiration, thank you for another super challenge. ... thanks too for popping over, Mo had this made for five days now but no time to blog .. even now it is a rush! but am here. Pray all is well with you,and thanks for being faithful to run this challenge too dear friend. .. am right for pine branch die as have one similar. Superb Rudolph Day cards Mo. Bit late in commenting, sorry! Great inspiration cards from you! Thank you!